YOU MUST START WRITING YOUR DATA IN THE UDRIVE once PHASE 1 IS ANNOUNCED. Down the road, once all user data from local drive are moved over successfully to the UDRIVE Cloud storage, the file tree on local hard drive will no longer appear within Topspin. 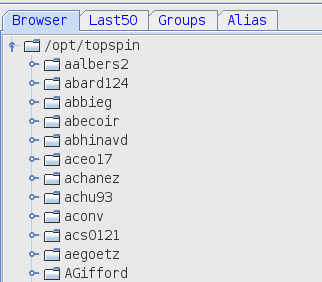 For software legacy reasons, you will still see a stump of a tree in the form of /opt/topspin. But this will be empty. 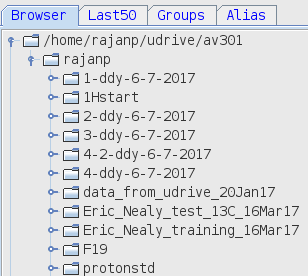 Appearance of your UDRIVE data branch. Your NETID will appear under its main root. After Phase 2, we will still be providing FTP server link to AV301’s local data drive, for a few weeks. But remember, this will be a STATIC data tree and contain only your old datasets. In case you haven’t backed up Legacy Data, that will be a good time to get it over with.